Simple living and high thinking is the mantra for the Bhutanese people. A nation that assigns statistical peg to its happiness (Gross National Happiness) and is delightfully cut off from Western influences, Bhutan is an otherworldly experience. It’s hilltop monasteries, vibrant local life, festivals and rich bio diversity makes it one of the most coveted destinations for the offbeat traveller. It is a fascinating place, which still holds its King in reverence. All in all Bhutan is all about heartwarming charismatic simplicity. Trip to Bhutan can be planned throughout the year, but most suitable travel periods lie between March to May and September to November. The winter months from mid November to mid March are cold and the monsoons usually arrives in mid-June, with light rain falling mainly in the afternoons and evenings. Bhutan’s topography has a vast span from near tropical plains near India to snow capped mountains bordering Tibet. Temperatures vary in large degrees between nights and day. Travellers are recommended to dress appropriately in layers to be able to enjoy the scenic vistas and local life, despite the swing in temperature. The delightful ambience and the happy occupants of all the towns of Bhutan are what makes the country, the happiest nation in the world. 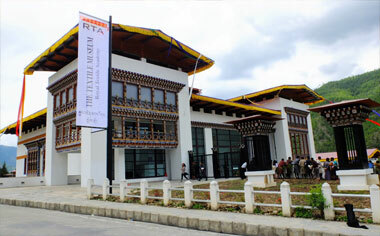 Thimphu and Paro, the most popular of all are the expected ones on the itineraries. But apart from these, Punakha, Bumthang, Gangtey and many more offer a peek into local life and history. 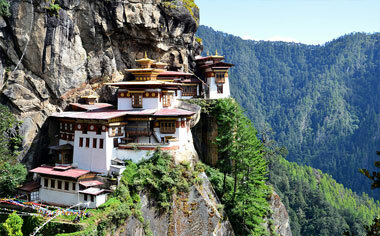 Tread towards the obvious and some of the offbeat to get a true sense of Bhutan. The sights, people and festivals of Paro are bound to leave an imprint on your mind long after you’ve left the happiest country in the world, Bhutan. Forests rise around the small town, in the middle of which stands the 16th-century Paro Dzong monastic fortress. Everyone in Bhutan imbibes the local culture, and Paro is especially good to see a large part of the town still dressed in the traditional outfit. The tapestry of nature is an added advantage. 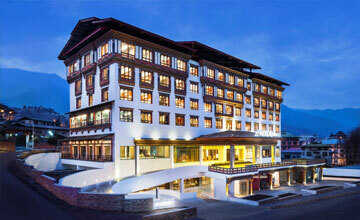 Little commercial exuberance has hit the capital city of Bhutan. Yet, it is well equipped and serves as an ideal base to cover many parts of the country. The last few years have seen sudden surge in traffic, but the city still holds its charm intact – it is not difficult to spot robed monks walk between camera wielding tourists. As any other capital of a nation, this is also the place where most important administrative buildings are located. 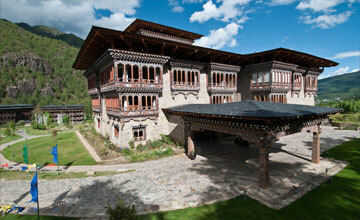 Spend a substantial time here to understand the authentic atmosphere of Bhutan. The once capital of Bhutan, Punakha is now relegated to a more sedate, but coveted job – ushering its visitors into a tranquility. The relatively warm town is encased in paddy fields that drape the valley. Two blue capillaries, the Pho Chu and Mo Chu (rivers) cut across from here. Excellent views, heart-warming association with culture and the great Punakha Dzong are the highlights of this town. Largely a farming specific town, it is best for travellers to come, unplug and relax here. The bright green town of Trongsa is located in central Bhutan. Apart from the abundant natural beauty, it is home to the first temple, which was built in 1543 by the Drukpa lama Ngagi Wangchuk. He is said to be the great-grandfather of Ngawang Namgyal, Zhabdrung Rinpoche, the unifier of Bhutan. Even though the ancient town has a simple and serene vibe, ideal to unwind, it is the hotspot of political and administrative activity of the nation. It was here that the campaign to unify the country was born. Till date, there is a strict rite of passage for the royalty before they take power. The Crown Prince of Bhutan, including the current King, needs to take the responsibility as the Trongsa Penlop (governor) before ascending the throne. The U shaped valley is where the magnificent Gangteng Monastery of the Nyingma sect stands in central Bhutan. This is the spot where the black-necked cranes from the Tibetan Plateau migrate in the winter season to roost. Gangtey is well known amongst the tourists for two main reasons; one, for the Crane Festival that welcomes the black-neck cranes in winters and the other, a great 3-day trek. 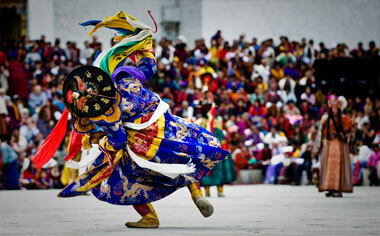 The crane festival is held every year in the Gangtey Monastery courtyard. Jakar in the Bumthang Valley offers an idyllic respite to the travellers, with its soothing surroundings and the tranquil white dzong that shadows the entire town. This is a popular tourist destination for the dzong and the namesake fortress along with ample options for hikes around the valley. 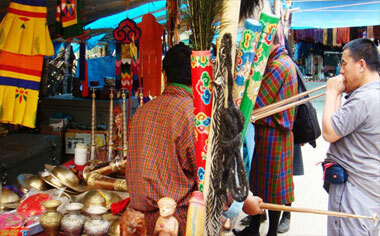 The market is another interesting place, where one can see Bhutanese traditional crafts on display. Spoken of in unison, the two towns lie in the eastern part of Bhutan, three hours drive apart. 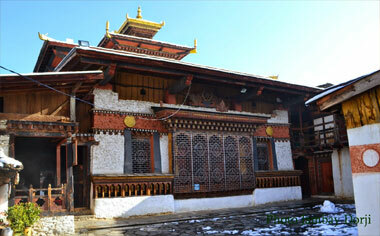 Mongar is known for its dzong, which was originally built in 1930s but has some modern architectural features. Lhuntse, on the other hand is quite isolated and home to the ancestral palace of the ruling dynasty & notably famed for its weavers and their special textiles generally considered to be the best in the country. The draw of the two places lies in their offbeat and stunning location. Lying on the east side of the valley above the Drangme Chhu River, Trashigang is a gem in the topography of eastern Bhutan. The unassuming town exudes a simple charm for the travellers, who come here to take in the serene environs and see local life at close quarters. The Trashigang Dzong, the venue of the town's yearly tsechu (festival), is the only sightseeing attraction here. A small town in eastern Bhutan, Trashiyangtse has a big responsibility of being the art centre of the country, after Thimphu. It is home to The School of Traditional Arts. This is also known as Rigne School, a smaller branch of the School of Traditional Arts is in Thimphu. There are six forms of local art that are taught here. Students of painting, pottery, wood sculpture, woodturning, lacquer-work and embroidery can be seen, hunched over their pieces, engrossed in the ancient skills of the country. The town is also famous for its wooden containers and bowls, which make inexpensive, attractive and useful mementos of a visit to this remote region & prized throughout the country. Samdrup Jongkhar lies on the southeastern edge of Bhutan, straddling the border with the state of Assam in India. Primarily an industrial town and economic centre of the country. The town’s legacy lies in trade, as this was also the erstwhile trading route of the 1960s’. Located in southern Bhutan, Phuentsholing shares the border with India, but both countries are distinctly different. Apart from stunning views of the mountains and the crisp cathartic air ideal for short hikes, the town is known for carpet weaving, a Buddhist college called Palden Tashi Chholing Sherda and a crocodile breeding centre. It also serves as the convenient entry/exit point for Bhutan and also the important link to visit the Indian state of West Bengal & Sikkim. Apart from the capital, Thimphu, towns like Paro and Punakha figure high on the list for travellers. In Paro, sights like Paro Dzong, Drukgyel Dzong, the National museum and the bazaar are the top highlights. In Punakha Valley, one is likely to get regaled by the stunning views. The Dochula pass between Thimphu and Punakha offers brilliant views of the towering peaks. Trongsa and Bumthang are the other places that one must not miss. One of the most important places of worship in the country, the Taktsang Monastery clings to a cliff, 900m above the Paro valley floor. This is also known as Tiger’s Nest. Unparalleled views, three scenic trails and an intense spiritual ambience are awarded to visitors who come here. No wonder, this is one of the most popular destinations in the country. It comprises of 8 caves, each with a distinct name. It is said that Guru Padmasambhava entered the caves on the back of a tigress. Monks of the monastery are supposed to live and meditate in these caves for 3 years. Drukgyel Dzong was built by Zhabdrung Ngawang Namgyal, and is synonymous to the ancient ruins that go by the same name. 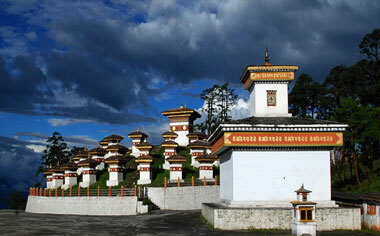 These are considered as a one of the most stunning and famous archaeological sites in Bhutan. Located on a ridge in the upper Paro valley, the ruins have served as an integral defense fortress since its construction in 1649. In 1951 the ruins were destroyed by a fire but still remain to be a symbol of pride amongst the locals. 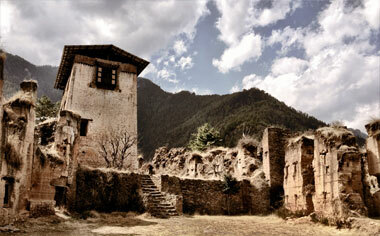 Dzongs refer to a fortified complex that served as a seat of military and religious importance in Bhutan. Historically, these were veritable museums where religious and administrative texts, and valuable artifacts were housed. Today, the Dzongs have becomes cultural and religious hubs in Bhutan. They serve as religious and administrative centers and even venues for festivals at different parts of the year. Though there are numerous Dzongs in the country, the top five Dzongs of Bhutan that travellers must include in their itinerary are, Punakha Dzong, Wangdue Phodrang Dzong, Paro Dzong, Trongsa Dzong and Dagana Dzong. Ngawang Namgyal, the 1st Zhabdrung Rinpoche, founded these, along with many more. It is recommended to visit these Dzongs to get an insight into the architecture and significance of these cultural hubs. Also known as the Rinpung Dzong or ‘the fortress on a heap of jewels’, this is one of the most important and well-feted Dzongs, and a stellar example of Bhutanese architecture. Paro Dzong is located on the edge of the Paro Chhu and can be reached by crossing a traditional cantilevered bridge. The Paro Dzong is the venue of the energetic and vibrant Paro tsechu, which is held in spring. 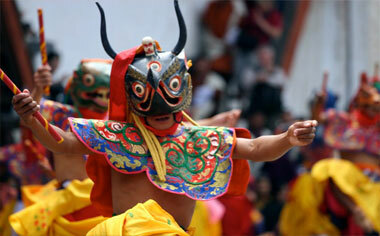 A popular festival of the nation, it draws people from far off places to enjoy the masked dances performed by monks. Tucked away in the eastern province of Bhutan, Lhuentse Dzong is propped on a rocky mountaintop of the Kuri Chhu valley. 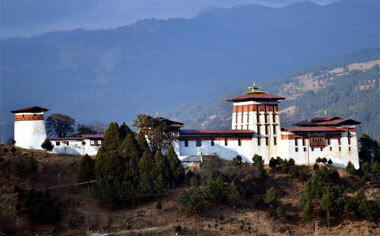 The area has another significance; it is the ancestral home of the Bhutanese royal family. The Lhuentse Dzong houses a small clutch of monks who follow a rigorous religious schedule of Buddhist studies, but for visitors, this is a laidback place with stunning views and traditional weaving as veritable travel hooks. Originally a monastery established in 1549, this Dzong was the seat of the first King of Bhutan. 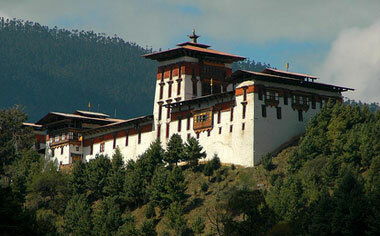 It was in 1667 that it was shaped as a Dzong. Located in the high reaches of the Chokhor Valley it offers great views of the rolling hills and the lush valleys within. 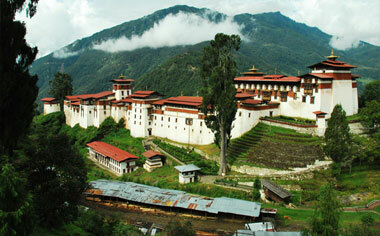 There is an interesting legend about this Dzong. It is said that a group of lamas identified this area when searching for a suitable location for a new Dzong. They saw a single white bird circling high above in the sky and then settling on a hill. This seemed like a good omen and the location was fixed, giving the Dzong a moniker of ‘Castle of the White Bird’. Located in Trongsa Dzongkhag district, the 17th century Dzong lies on the erstwhile route between the east and west of Bhutan, on a high hill. Excellent views and a serene atmosphere add to the spiritual flavour. 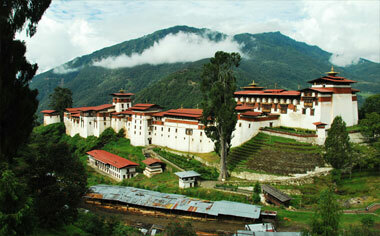 The Dzong was regarded as an important administrative hub, thanks to its central location. It sits atop a ridge above the frothy Mangde River and the namesake town. Punakha Dzong is located at the confluence of Mo Chhu and Po Chhu, in the lush Punakha Valley. Built in the mid 17th century, it houses the remains of Zhabdrung Ngawang Namgyal who unified Bhutan as a nation state and is the 2nd Dzong to be built in Bhutan. 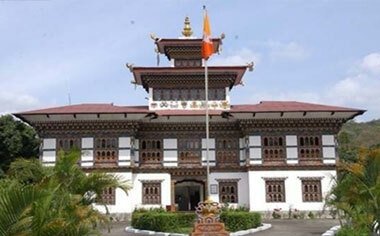 It functions as the winter residence of the central body of monks of the country. 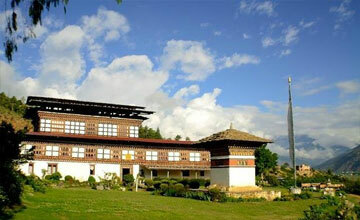 The Dzong is known for its impressive gardens and bountiful natural environs. Spring is an ideal time to visit here. The hundred-pillar assembly hall and the murals depicting the life of Buddha are the two main striking features. Also known as the Tamzhing Lhündrup Monastery, this is located in Bumthang district of Bhutan and is home to 95 monks, who follow Sungtrul Rinpoche, the current speech incarnation of Pema Lingpa. The low-key monastery was up for being listed as part of the World Heritage site at one point. The 16th century monastery is known for its impactful religious services for the community and educating the young monks. One of the oldest national parks of the country and a worthy showcase of the bio-diversity; this should be on the list of wildlife enthusiasts. The rare golden langur is something you should keep your eyes peeled for, other than the Bengal tigers, elephants, gaur and other species of fauna. The Manas River runs through the park, adding a stunning dimension to it. One the largest national parks of Bhutan, the Jigme Dorji National park drapes more than 4000 sq km of the country. 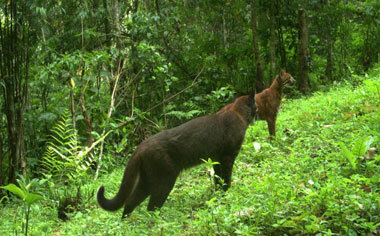 The park is home to an impressive number of vulnerable & charismatic species. The snow leopard, clouded leopard, Bengal tiger, bharal, Himalayan blue sheep, Himalayan black bear, red panda, Ussuri dhole, and spotted linsang are some of them that inhabit the forests and mountains of the park. The park is so big that it also has glacial lakes and places of historical importance within it. Most of Bhutan’s most popular trekking routes can be found inside the Jigme Dorji National Park. A UNESCO Heritage site hopeful & virtually untouched by development, the Sakteng Wildlife Sanctuary is home to endemic species of the subalpine conifer forests eco region, the eastern blue pine and the black-rumped magpie. 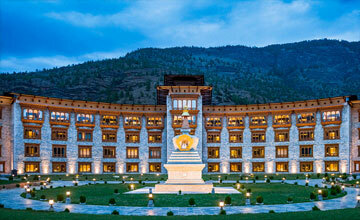 The sanctuary represents the eastern topography of the Himalayan country of Bhutan. Legend goes that the sanctuary was created to protect the migoi, the mythical Yeti (or the “Abominable Snowman”), whose existence is believed by the locals but has never been scientifically proven. The Sanctuary is also home to people of isolated nomadic tribes. It is characterized by thick carpets of rhododendrons, and in its habitat roam snow leopards, red pandas, Himalayan black bear, barking deer, Himalayan red fox and the hoary-bellied Himalayan squirrel. 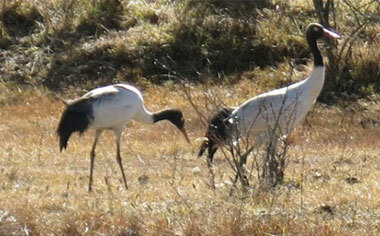 The sanctuary covers more than 1500 sq km of the northeastern part of Bhutan and is key to the black-necked crane population of the country. 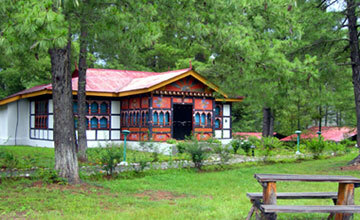 It is an integral haven for birdlife of Bhutan and brings thousands of birders to the country. The Bumdeling sanctuary is a hotspot for diverse flora and fauna, along with stunning green scapes dotted with alpine lakes and rise and fall of the Bumdeling Valley. The Buddhist tradition of Drukpa-Kagyud was first introduced to Bhutan in the 13th century by Phajo Drugom Zhigpo. He travelled extensively in the country to propagate the teachings as prophesized by Tsangpa Gyaray Yeshe Dorji, the founder of Drukpa-Kagyud tradition. There are 16 sites that are associated with Phajo Drugom Zhigpo, spread all over the small Himalayan country. These are Jago Dzong, Yangthe Thuwo Dzong, Taktshang, Tango, Gomdra, Thujedra, Draphu Senge gyaltshen,Tshechudra,Tsendong dowaphu, Langthangphu, Sengyephu, Gawaphu, Hungrelkha, Changkhag, Wachen and Dodeyna. Of the many adventure and culture filled experiences, climbing the Tiger Nest Monastery (Taktsang Palphug Monastery) is on the list of essential experiences in Bhutan. 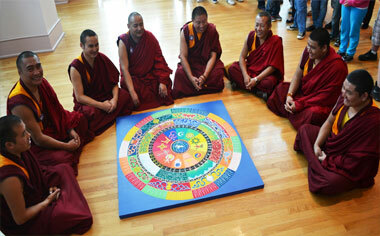 Others include visits to the many monasteries and the Buddhist festivals that are held regularly through the year. These are called ‘tshechu’ in local language and are a good place to see masked dancers and whole towns draped in vibrant colours. The Bumthang valley is great for mild and tough treks. 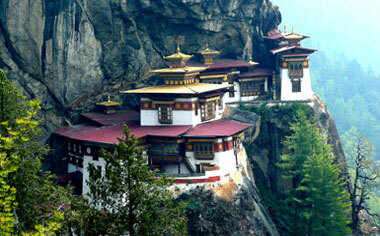 Bhutan has a wholesome offering of experiences for different moods and tastes. 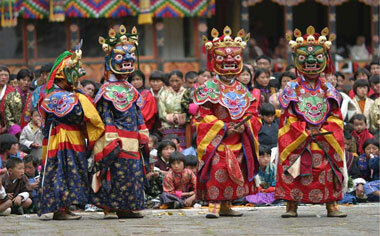 The masked dances of Bhutan are an unmatchable experience in the country. Consider yourself extremely lucky if you get to see one. 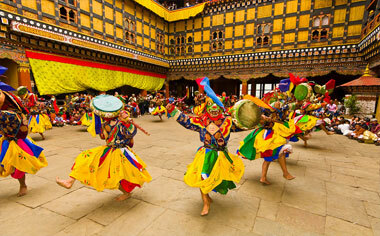 The art, dance, drama and music make for the fundamentally strong culture of Bhutan. The music of Bhutan is an integral part of its culture and plays a leading role in transmitting social values. Traditional Bhutanese music includes a spectrum of subgenres, ranging from folk to religious songs and music. While you may get a glimpse of these during your trip to monastic festivals, private, customizable experiences can also be arranged in an intimate setting, with explanations. This way, you will be able to absorb the nuances much more deeply. 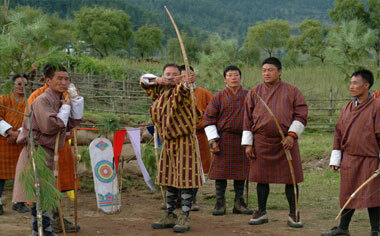 Being the national sport of the country, archery is something that is easy to see during the festivals. Most villages have an archery range, which is used maximum during celebratory times. High-spirited competitions, usually accompanied by a banquet, are a part of all festive occasions. These occasions are when the whole village comes together and is the best showcase of their culture. But if you do not catch a festival during your trip, the archery showcase can be organised personally for Indo Asia guests. This means, that you can get first row seats along with an opportunity to participate in this powerful display of skill and culture. This is a religious ceremony aiming at peace, prosperity and happiness for everyone. At the request of our guests, this special prayer ceremony can be organised in the serene environs of a monastery by a team of monks in Paro or Thimphu. It includes chanting by the monks and guests are required to light butter lamps at monastery alter. While travelling to Bhutan, the idea is to get immersed in local traditions and culture; food is a large part of that. This is a special cooking session. Here, a team of chefs demonstrate how local Bhutanese delicacies are prepared and guests can also try their culinary skills with the help of instructions. Expect to learn how to make the fiery ‘Emma Datshi’, made with chilies and local Bhutanese cheese. This is the national dish of Bhutan. Like any other destination, the best of Bhutan can also be seen only from the eyes of locals. 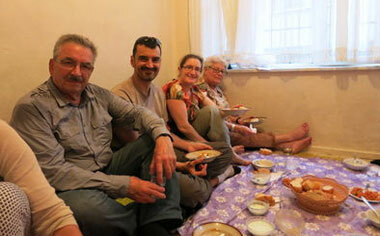 The best way to that is to be invited into a local home - that too, for a meal. We, at Indo Asia, organize a meal with a local family, where you can go traditionally dressed and get inducted into the local lifestyle. Savour the local delicacies of the region and enjoy being part of the family. Bhutan’s mountainous regions make excellent trails for mountain bikers. This adventure sport is extremely popular with intrepid bikers and also one of the best ways to see the country at close quarters. 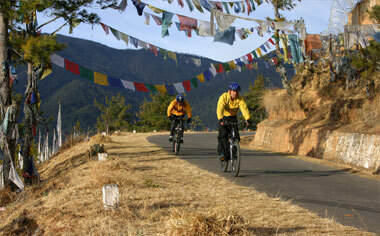 Biking often involves crossing 3000+ meter high mountain passes. Alternatively, one can drive to the pass and bike downhill. Back up vans and instructors go along with you if required. Mo Chu river originating in the mountainous hills of Northern Bhutan and Pho Chu river fed by Glaciers in upper Punakha glacial valley offer tremendous rafting opportunities for adventure lovers. The Pho Chu River, with its approx 16 km course has about 15 rapids of class 2-4 and Mo Chu River with 10 Km course has 10 rapids of class 2 - 2+. After the confluence of these two rivers near Punakha Dzong, the main river is known as Puna Tsang chu. This too, offers a thrilling time its frothy rapids. Paro and Punakha are the ideal locations to visit a traditional farmhouse in the country. 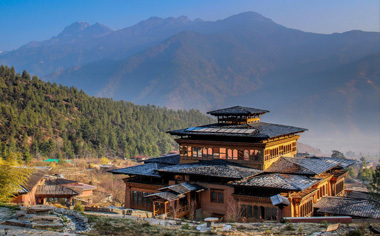 Bhutanese farm houses are very colorful, decorative and traditionally built with mud and stones, and without the use of a single nail – an architectural marvel. All houses follow the same architectural pattern. A visit to a farmhouse over a cup of tea is an excellent way to understand the building style and also other local practices. If guests are interested, we can arrange a meeting with a learned monk in any of the towns in Bhutan. This will help the guests to understand the deep spiritual hook that the locals imbue and how it affects their life - part of the reason why the Bhutanese are deeply satisfied and calm people. The country is highly evaluated on personal happiness and this may be a chance to understand that. If any one subject is of interest to the guests, Indo Asia can organise a special lecture session with an expert. Topics varying from Bhutan’s Ecology & Environment, Bhutan’s Cultural Heritage, Bhutanese Buddhism, Gross National Happiness to Local Bhutanese Textiles can be covered. An hour long talk with a question and answers session, as well as interaction with the speaker can be arranged. 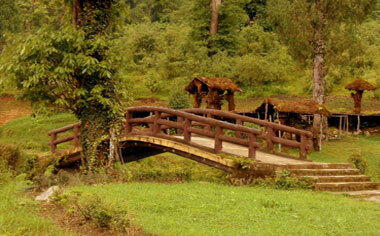 Phobjikha Valley offers some of the most serene environs to unplug and relax in the country. The fact that this part of the country is quite untouched by western civilization, the hum of the slow traditional village life is the biggest draw of the place. This region is an ideal place to unplug and relax. One can also visit a local Govt. school and meet the kids or see women weaving local fabric on their looms. The largest draw of Phobjikha is the arrival of the winter visitors - Black necked cranes and an entire festival organised for their conservation. 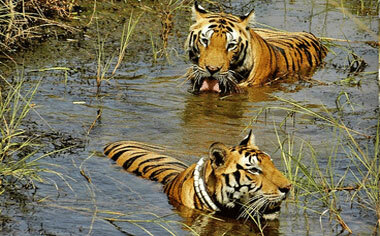 It is heartening to see the locals truly invested in this and working closely towards awareness for conservation. Located between Thimphu and Punakha, the Royal Botanical Park is propped at an altitude range of 2100 -3750 meters. The park covers an area of 47 square kilometers and contains a rich biodiversity of flora and fauna. It features a huge species of plants and animals including endangered species such as the Himalayan yew, native Rhododendron, Royal Bengal Tiger, Musk Deer, Red Panda, Blood pheasants and Himalayan Monal. The park has 14.5 km of trails for eco treks, cycling and walking. One of the main attractions here is the rhododendron garden. 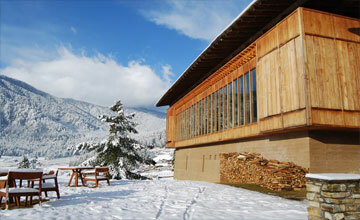 The Swiss Farm is a development project established by Mr. Fritz Maurer, one of the first Swiss to work in Bhutan. The establishment is now run by his son in Bumthang. The project introduced brewing, farming machinery and fuel-efficient smokeless wood stoves to the valley, as well as its first tourist guesthouse. The milk from large Jersey cattle is used in Bhutan's only commercial cheese factory and Bhutan's only native beer, Red Panda, is brewed here. This institute was opened in June 1997 in Trashiyangtse to provide opportunities in vocational training for those who do not continue in the system of higher education in the country. The school strives to produce technically proficient craftspeople, while providing them with a basic educational foundation. Six of the Zorig Chusum (13 arts and crafts) are studied here, including thangka painting, sculpture, metalwork and woodcarving. You can visit the school, watch the students at work and take photographs. 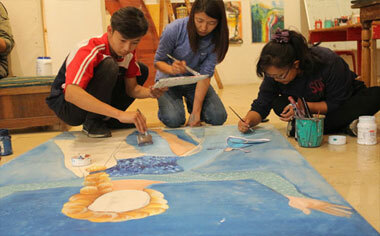 The impressive Voluntary Artists Studio Thimphu in Chubachu is capital's main centre for artists. The goal of the studio is to promote both traditional and contemporary works of Bhutanese art and to provide vocational training for young artists. This also acts as the creative meeting place for artists. It's a great place to take a peek into the Thimphu art scene. Art by the students and instructors is also sold here. Discover the beauty and diversity of the living textile arts of Bhutan at the Royal Textile Academy. They have the finest examples of woven, embroidered and appliqued textiles on display alongside relevant production techniques at the Textile Museum, a section one must not miss here. Visitors can also observe weavers and embroiderers at work. The traditional Bhutanese hot stone bath, known as Dotsho in local language has been practiced in Bhutan for centuries as a medicinal soak. Many Bhutanese believe that the bath helps in curing joint pains, helps in relaxing and alleviates other medical problems. River stones are heated and then put in water to heat the bath; sometime medicinal herbs are added to the water before it is ready for the soak. This can be arranged in Paro, Thimphu and Punakha. As part of the Bhutanese culture, guests are given a white scarf, known as the ‘tashi khaddar’. This is a traditional and auspicious way to welcome guests. This can be organized on arrival at the airport or hotels, so that guests can get oriented into the local culture right away. Built in 2008, coinciding with the coronation of Bhutan’s Fifth King, this is also known as the Centennial Farmers Market. Most of the Thimphu’s population and many valley dwellers converge on the bustling weekend market. A wide range of food and local arts and crafts are sold at the market. A visit to the market provides great photo opportunities, as well as the chance to mingle with local people and perhaps buy souvenirs. The market is organized on Fridays, Saturdays and Sundays. A lunch at the sprawling Royal Golf Club in Thimphu is a great way to spend an afternoon. Guests can hit a few rounds and relax in serene environs of the large golf course. It is set in the valley, circled by the Himalayas. Apart from the great food, the scenic view around is reason enough for you to love this. The national dress of Bhutan is one of the most distinctive and visible aspects of the Dragon Kingdom. Men wear Gho, a long robe raised till knee, folded backwards and then tied around the waist by a Kera (belt). Women wear an ankle length robe called Kira. The Bhutanese textile is made from fine, hand-woven or milled fabric, with the colorful distinctive patterns. You too can dress like locals and even pose with an archery kit as it is the national sport of the country. This can be arranged & worn during any special occasion during the tour. A festival or ‘tshechu’ is the most vibrant time in Bhutan. Most of the festivals are held in monasteries where masked dancers and local musicians take to the stage, as locals sit in rapt attention. 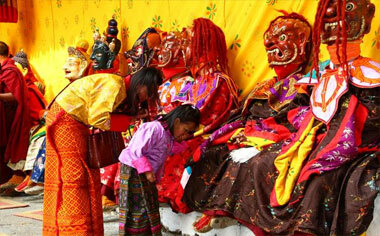 Travelling to Bhutan during these festivals is sure to add a great dimension to your travels. Many of Bhutan’s festivals are spiritual in nature, commemorating the great Buddhist teachers of the land. Monasteries and villages around them are the best places to see the full scope of the reverence that people still feel. The most unique festival is the Black Necked Crane Festival held in November at the Gangtey Gonpa in Phobjikha. 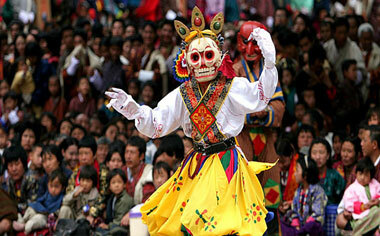 The second largest Bhutanese festival is held in the city of Paro. The tradition of Cham dances with masks is the highlight of the celebrations. The festivities spread to the streets with local markets being set up. The last day of the five-day festival is the most important, when the Thongdrel, a very large scroll painting, is unfurled in front of thousands. One of the biggest festivals in the country, attending this three-day monastic extravaganza is a traveller’s dream come true. It begins on the 10th day of the 8th month of the lunar calendar. 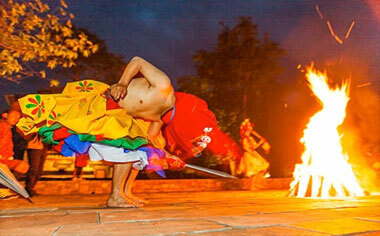 The festival involves prayers and rituals to invoke the Gods. The highlight of the festival is the masked dances that are held during this period. 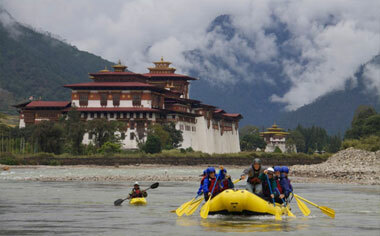 The Punakha Tshechu first started only in 2005, in the western part of Bhutan. The annual festival is held to preserve the Buddhist teachings and keep the noble deeds of Zhabdrung Rimpoche alive, in the minds of his followers. Traditional dances, food stalls and markets make the atmosphere vibrant. 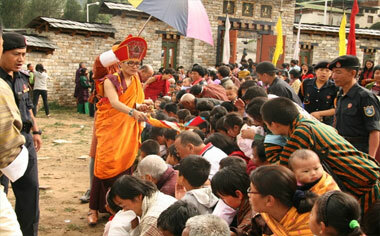 The annual Wangduephodrang Tshechu was first introduced by Zhabdrung Ngawang Namgyal on the completion of the Dzong. This is a three-day Tshechu that is attended by people mainly from Punakha and Thimphu. An ambience of merrymaking and revelry fills the town. The Tshechu is known for the Raksha Mangcham or the Dance of the Ox. It concludes with the unfurling of the Guru Tshengye Thongdrol where people collect to receive blessings. 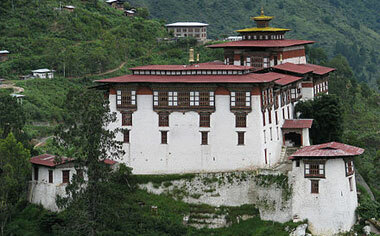 Jambay Lhakhang is one of the oldest temples in Bhutan. It was founded by Songtsen Gampo, a Tibetan King in the 7th century AD. 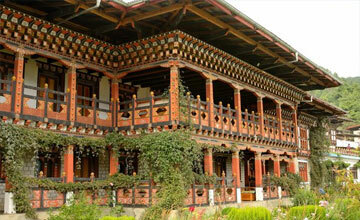 Jambay lhakhang is located in Bumthang and is situated on the way to the Kurjie Lhakhang. There is annual festival on the calendar here, where the highlight is the fire ritual that is held in the evening. Massive crowds gather to witness the ritualistic naked dance. The festival goes on for five days. 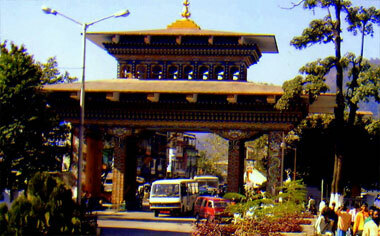 Situated in central Bhutan, Trongsa was once the seat of power over central and eastern regions. Today, it is known for one of the biggest festivals in the country. The three-day annual Tshechu brings together people from all walks of life. In addition to traditional mask dances, visitors can witness the unfurling of the sacred Thongdrol and receive blessings from monks. People also receive blessings from the sacred Nangtens that are opened during the last day of the Tshechu. 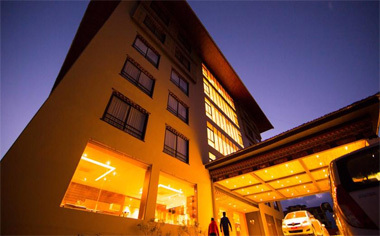 It is unlikely to find many starred accommodations in Bhutan, but one can be assured of the quality and comfort, given that the better stays are accredited by the Tourism Council of Bhutan. 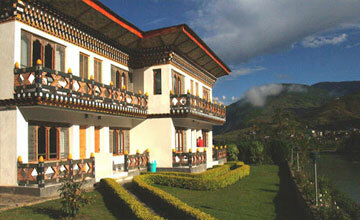 Traditional Bhutanese aesthetics are a given in most of the accommodations. But that is not to say that one will not find modern comforts. 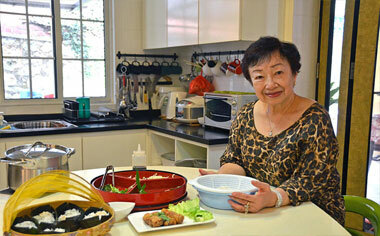 A mix of local and International cuisines is available in most of them. 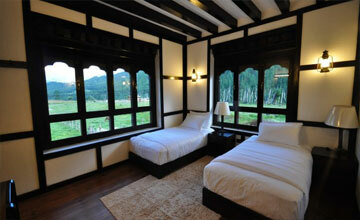 The one thing that is likely to be common to all of Bhutan’s accommodations is the scenic views from the windows. You will also find a smattering of high-end holistic healing focussed properties. Discover the beauty of Bhutan by being perched on the top of a hill with blue pine trees all around. Close to the sightseeing spits of Paro, Hotel Olthang has the best of both worlds – ease of sightseeing and being able to unplug and relax. This is one of the oldest hotels in Bhutan. Since the hotel has been around since 1974, the guests were even invited to the coronation of His Majesty the fourth Druk Gyalpo Jigme Singye Wangchuk. 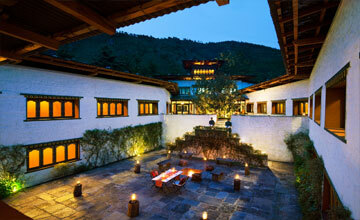 A family-run resort, Meri Puensum offers ideal environs to match the serene valley of Punakha. Local tradition is a large part of the hospitality here. Of all the things, the dining is one of the best parts of the heritage hotel. Here you can have local cuisine. Well-equipped Standard and Deluxe rooms offer comfort after a whole day of sightseeing, the access to which is very easy from here. 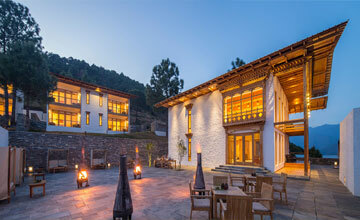 Emulating the local aesthetics, Naksel is an ideal pad to take in nature’s beauty in Paro. More than anything Naksel is built on the foundation of sustainable tourism in an eco friendly, energy efficient way with a sound concept of keeping in tune with local heritage. This can be seen in the mud brick walls, intricate pillars and locally crafted furniture. A stay at Naksel is local immersion in every way possible. 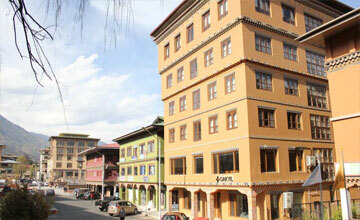 Local heritage and contemporary amenities come together at Hotel Ariya in Thimphu. Spacious rooms, a well equipped spa and in-house dining options including a café are the highlight of this boutique hotel. The hotel also lies in a central location, so access to all sightseeing places are convenient. Propped in the valley of Thimphu, Bhutan’s Dzong architecture and modern design comes together at Taj Tashi. In true Taj style, the hotel is a cynosure of comfort and luxury, although with an earthy feel. The 66 spacious suites, ample dining options, a relaxing spa and insights into the local culture add up to make this a memorable stay for guests. The best part is the musical evenings, when local artists enthrall guests with traditional music. 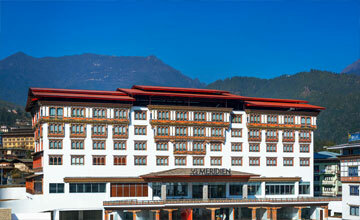 The largest 5 star hotel in Thimphu, Le Meridien offers exemplary amenities and facilities, true to the trusted brand. Both chic and contemporary, yet rooted in local aesthetics, the 78 rooms are spacious and well equipped. The hotel is located in the heart of the city with great access to sightseeing spots. An indoor pool, spa and many dining options make it a class apart. 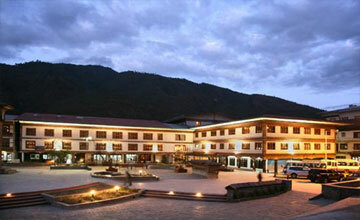 Located on the Phuntsholing- Thimphu highway, the resort is suffused in refined simplicity and local architecture. The luxurious rooms and the spa are the highlight of the hotel. Add to that the stunning location at the edge of the river and you have the perfect place to unwind. There are three dining options in the resort and ample local information to help you plan your day. 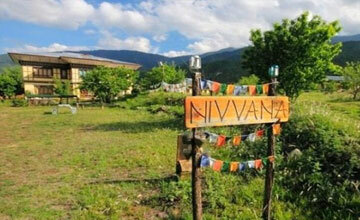 Wellness is the highpoint of Amankora in Bumthang in the Himalayan Kingdom of Bhutan. 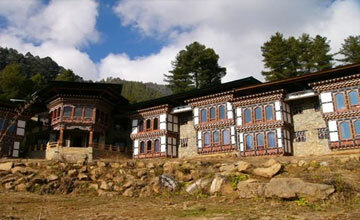 The hotel has 16 suites that overlook the Wandichholing Palace, within the town of Jakar in the Choekhor Valley. Amankora is one of the best accommodations in the country that truly offers a place to unwind and unplug. Even the dining experience is special with Bhutanese ingredients as the mainstay of the menu. Romantic dinners, easy hikes and knowledgeable experts at the resort who can help you plan the days are a part of the experience. A gurgling river and the idyllic view of mountains give you company at Le Meridien, Paro. The resort offers contemporary amenities, world class dining options and is accessible to all sightseeing options. Even though the hotel has all modern amenities, it s the local aesthetics that add to its charm. The good thing is that, no matter which room you choose, you can get great views, either the mountains or the sprawling garden below. Located at an enviable spot in the Paro Valley, Uma Como is a 29-roomed luxury resort. Contemporary facilities and amenities complement the high-end spa of the hotel, which is the most popular part of the experience here. The view of the forests, mountains and the dipping valley add to the cathartic time here. At Amankora in Gangtey, guests have the front row seats to stunning landscapes. Eight suites overlook the undulating valleys of Gangtey and the 16th century Gangtey Goemba monastery, offering tranquil environs to unplug. This is part of a wildlife reserve, which means that one is constantly in company of nature. 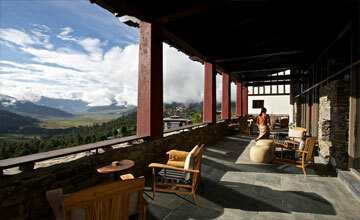 Here, every window literally gives you a glimpse of the untouched Bhutan with magnificent views. Add to that the facilities, and you have a perfect holiday. Easy hikes from the resort, great rooms and cycling circuits surround the property. The cosy boutique hotel offers the best of Bhutanese culture and aesthetics, along with contemporary facilities and amenities of the 21st century. The hotel is built on a 10acre sprawling farm, but has the best of both worlds – a bar, meditation room, many dining options and comfortable rooms that overlook the towering mountains around. The environs along with the facilities make this an excellent local pick to stay at. Located in the vibrant valley of Bumthang, The Village Lodge offers nine rooms, making it a cosy and personalized stay. Even though the lodge is well equipped with modern amenities, it is the nature’s lush hand around it that makes it one of the preferred boutique places for travellers to stay. A multicuisine restaurant, lounge, bar and wi-fi is part of the offering. 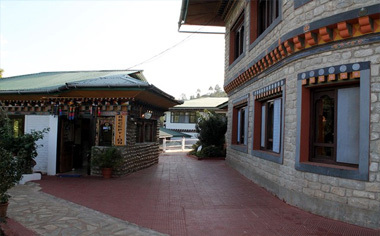 Operating since 1985, Hotel Druk is one of the oldest and well-seasoned heritage accommodations of Bhutan. The highlight of your stay lies in the warm hospitality and the aesthetics of the hotel. Comfy rooms and attentive staff make your stay comfortable. Since you’re in the middle of town, it is easy to access the sightseeing spots of the town. 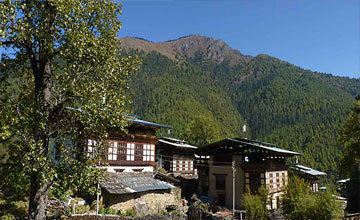 One of the recommended places to stay in Paro, Gangtey is the embodiment of the hospitality and aesthetics of Bhutan. 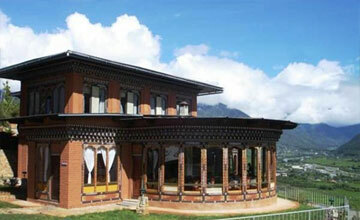 It is a 19th century Bhutanese building that was once the residence of the penlop of Paro. Historical charm apart, it has rooms that overlook the garden, ample dining options and a cosy bar to unwind at the end of the day. This is truly one of the most atmospheric stays of the Kingdom. Visit here for sweeping views of the Punakha Valley and the frothy river that flows right next to it. The hotel is a heritage property that offers 16 comfortable rooms and breathtaking views of the surroundings. The hotel has a multicuisine restaurant, wi-fi, laundry service and a lounge but its charm lies in the views. 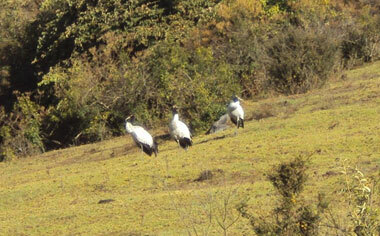 Located at the edge of a valley, Dewachen is the perfect place to see the black-necked cranes of the Phobjikha Valley. The rooms are traditionally styled but are fitted with ample amenities and facilities. It is also great for sightseeing, as it is accessible to popular sites. However, chances are that the guest will want to remain in the soothing ambience of the hotel itself. 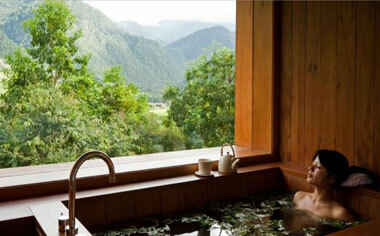 Overlooking the Paro valley, the Dewachen Resort is a great option for visitors. It lies only 20 mins from the airport and transports you into the heart of the mountain Kingdom immediately. Expect traditional aesthetics, warm hospitality and excellent facilities and amenities. The dining options include local Bhutanese food and that inspired from Tibet and India. 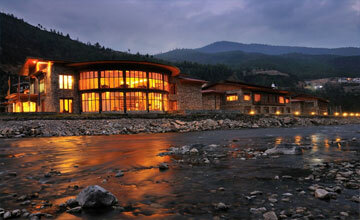 Nestled in the stunning Bumthang valley, the resort faces the river. What more can a traveller ask for? The lodge features comfortable rooms that are furnished in traditional style. All rooms are equipped with comfortable furniture, attached bath, running hot & cold water, heating and also offer sweeping views from the lodge balcony and verandah. There is an in-house restaurant with Indian, Chinese and Bhutanese cuisine and a bar. Nestled in a copse of pinewood and an exclusive view of the Wangdicholing palace, the Mountain Lodge is aimed at those who want to unplug from the bustle of cities. Here, you can surrender to nature and relax. Easy hikes, access to sightseeing spots, local cuisine in the restaurant and great views from all the rooms are the highlights. Clean lines, spacious rooms and an uncluttered ambience make for the look and feel of Hotel Gakyil. Its simplicity in aesthetics is made up for by the indulgent hospitality by the family that runs it. The best insights about the city and culture come from them. Since it lies in the heart of the city, the hotel offers excellent access to get around. The field outside Nivvana Lodge and homestay is it’s biggest aesthetic tinge. You can only see green as far as your sight goes. The lodge and homestay promises a quick induction and orientation to local life, away from the trappings of the hotels. It’s an unfussy, basic place but one that is characterful in more ways than one. Located in the heart of the lush Punakha town, the Dhensa Boutique resort offers an exclusive insight into local Bhutanese culture by focusing on the simplicity of life. This, by no means, means that the amenities and facilities are in dearth. In fact, the hotel has a contemporary ambience but the location in the middle of the hills, throws you in the heart of Bhutan’s stunning landscape. 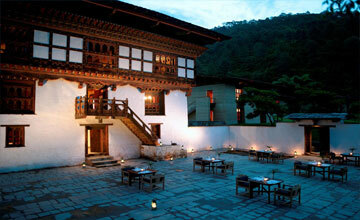 One of Bhutan’s best concept hotels, this one is suited to the sensibilities of a discerning traveller. Namgay Heritage takes great pride in bringing the guests closer to the local culture through architecture, arts and crafts. The highlight for many is the Chimi House of Design, an in-house studio where you can buy local textiles and curios. A gem for the offbeat traveller, Lechuna is a traditional farmhouse in the Haa Valley. Untouched by western influences, it stays in a time wrap with no hurry - an ideal place to switch off from city life. A day at the farm and walks around the villages is what one should look out for, when at Lechuna. Located in Paro, the 29-roomed resort offers a brilliant blend of cultural orientation and a stunning view of the mountain-scapes around. 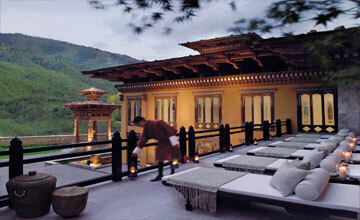 The rooms are accented with luxurious nuances with local Bhutanese hues. The resort is also focussed towards holistic healing with an indulgent spa and dining experience that goes along with it. 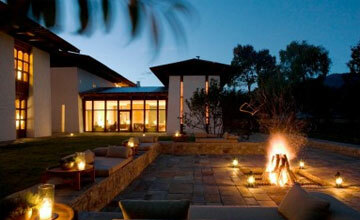 The wood and stone lodge in Gangtey amps up the trip with its nature inclined aesthetics. The 12 suites with in-room fireplaces are pods of luxury but where you would really like to relax is the dining area with earthen fireplaces and an incredible floor-to-ceiling window, offering a magnificent view of the mountains and the valleys below.